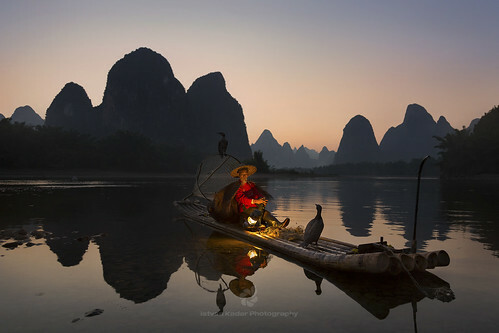 For thousands of years, fishermen have used trained cormorants to fish the rivers and lakes of China. To control the birds, the fishermen tie a snare near the base of the bird's throat. This prevents the birds from swallowing larger fish, which are held in their throat, but the birds can swallow smaller fish. When a cormorant catches a fish, the fisherman then brings the bird back to the boat and has it spit the fish up onto the bamboo deck. Cormorant fishing has been practiced in China and Japan since around 960 AD, although these days it is largely used as a tourist attraction.